I made myself a set of new coaters! I like how my coasters have irregular shape, which gives them a modern look! I used crochet cotton thread size 10 and a steel hook size 1.25 mm. Usually when I work with size 10 thread, I used 1.5 or 1.75 mm hook, but for this project I wanted my stitches to be especially tight and neat, so I went with a smaller size hook. The technique for this crochet lace involves using chains, slip stitches, and single crochets. 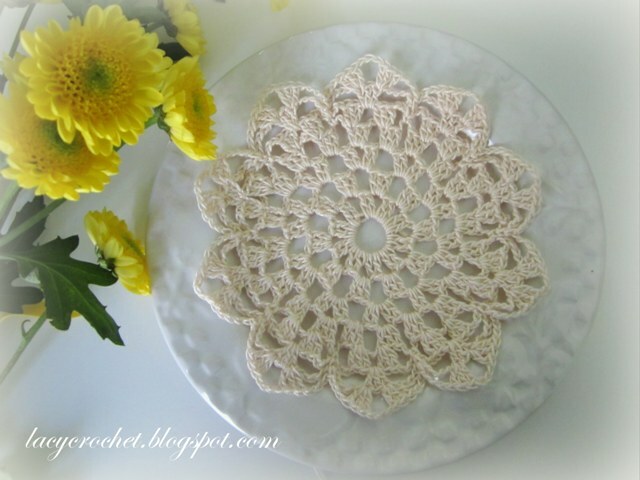 I made a detailed video tutorial for this freehand/freestyle crochet technique, and I also made a video on how to make such coasters. I hope you'll enjoy them! Happy Crocheting! Today I present you yet another lacy scarf made with chains, puff stitches, and single crochets. The pattern is quite easy, and there are only two repeating rows. This stitch is very light and airy and I think it will work nicely for a baby blanket too! Multiple of 6, plus 2. Row 1: (puff stitch, ch 3, puff stitch, ch 3, puff stitch) all in 6th ch from the hook, *skip next 5 ch, (puff stitch, ch 3, puff stitch, ch 3, puff stitch) all in next ch* across to last 3 ch, skip 2 ch, dc in last ch. Row 2: ch 6, turn, sc in top of 2nd puff stitch of next group of puff stitches, *ch 5, sc in top of 2nd puff stitch of next group of puff stitches* across, end with ch 3, dc in top of turning ch. Row 3: ch 3, turn, *(puff stitch, ch 3, puff stitch, ch 3, puff stitch) all in next sc* across, end with dc in 3rd ch (counting from bottom) of turning ch-6. Repeat Rows 2-3 for the pattern until scarf measures about 63 inches (or your desired length), end with Row 2. Last Row: ch 3, turn, *(puff stitch, ch 1, puff stitch, ch 1, puff stitch) all in next sc* across, end with dc in 3rd ch (counting from bottom) of turning ch-6. I am really enjoying making scarves in beautiful lace designs and delicate spring colors right now. For my next scarf I chose soft lilac color. I used one skein of Snuggly Wuggly by Loops & Threads yarn and a hook size G (4.25 mm). For the stitch pattern I used a combination of chains, double crochets, and puff stitches. The scarf can be easily made into an infinity scarf. Don't make the last row, and simply stitch the ends together. Make sure to flip one end to the other side to form a twist. I hope you will enjoy my pattern. I filmed a video tutorial for it as well. I only recently started my Youtube channel, and I greatly appreciate my new followers and supporters! Thank you! Feel free to leave me comments either here or on Youtube regarding what kind of crochet videos you would like to see in the future! Multiple of 10, plus 3. Row 1: dc in 4th ch from hook, dc in next 2 ch, 2 dc in next ch, ch 1, skip next ch, 2 dc in next ch, dc in next 3 ch, *ch 1, skip next ch, dc in next 3 ch, 2 dc in next ch, ch 1, skip next ch, 2 dc in next ch, dc in next 3 ch* across, end with dc in last ch. Row 2: ch 1, turn, sc in 1st st , ch 3, (puff, ch 2, puff, ch 2, puff) all in next ch-1 space, ch 3, *sc in next ch-1 space, ch 3, (puff, ch 2, puff, ch 2, puff) all in next ch-1 space, ch 3* across, end with sc in top of turning ch. Row 3: ch 4, turn, skip next ch-3, 5 dc in next ch-2 space, ch 1, 5 dc in next ch-2 space, *ch 1, skip ch-3 spaces, 5 dc in next ch-2 space, ch 1, 5 dc in next ch-2 space* across, end with tr in last sc. Repeat Rows 2-3 for the pattern. End with Row 2. Last Row: ch 3, turn, 2 dc in next ch-3 spaces, dc in top of next puff stitch, 2 dc in next ch-2 space, ch 1, skip next puff stitch, 2 dc in next ch-2 space, dc in top of next puff stitch, 2 dc in next ch-3 space, *ch 1, skip next sc, 2 dc in next ch-3 space, dc in top of next puff stitch, 2 dc in next ch-2 space, ch 1, skip next puff stitch, 2 dc in next ch-2 space, dc in top of next puff stitch, 2 dc in next ch-3 space* across, end with dc in last sc. Spring has already arrived to Northern California! We've been getting a lot of rain lately, and everything around is beautifully green and blooming! For my most recent crochet project I chose delicate mint green, a color that is perfect for spring! For the stitch, I chose a combination of clusters and open spaces, a beautiful lacy design that is perfect for spring as well! Multiple of 12, plus 1. Row 1: (tr4-cluster, ch 4, sc, ch 4, tr4-cluster) all in 7th ch from hook, *ch 4, skip next 5 ch, sc in next ch, ch 4, skip next 5 ch, (tr4-cluster, ch 4, sc, ch 4, tr4-cluster) all in next ch* across to last 6 ch, end with ch 4, sc in last ch. Row 2: ch 5, turn, (tr4-cluster, ch 4, sc, ch 4, tr4-cluster) all in top of next tr4-cluster, ch 4, sc in top of next tr4-cluster, *ch 4, skip next 2 ch-spaces, (tr4-cluster, ch 4, sc, ch 4, tr4-cluster) all in top of next tr4-cluster, ch 4, sc in top of next tr4-cluster* across. Repeat Row 2 for the pattern until you have a scarf of your desired length. (I used one skein of Caron Simply Soft, 315 yards, and my scarf came out about 51 inches long).